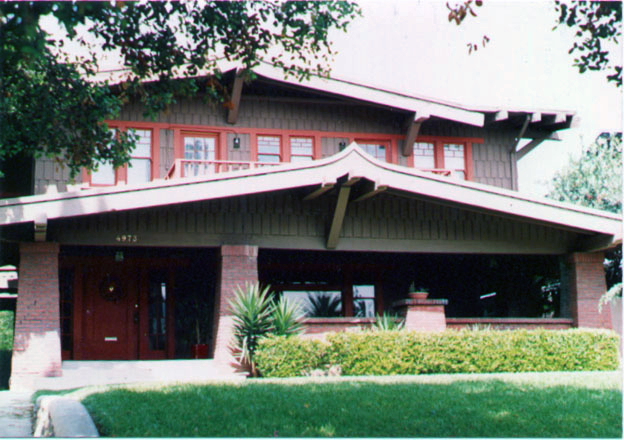 The Tustin House was built in 1912 for Mary Tustin, the widow of Columbus Tustin, who had subdivided the City of Tustin in Orange County, California. The home was built by the Milwaukee Building Company, builders of many fine early 20th century homes and commercial structures, including (under the name of Meyer & Holler) the Grauman’s Chinese Theater, the Egyptian Theater, the Fox Fullerton, and others. This house was saved from demolition when it and its neighbor were slated to be replaced by 20 apartment units. It was the line in the sand for the Highland Park Heritage Trust, which has been active in preservation in North East Los Angeles and helped establish the largest Historic Preservation Overlay Zone in the City of Los Angeles.